The duPont Registry has long been a way for people to sell interesting vehicles of all sorts. From million-dollar exotics and rare classics, to unique kit cars, duPont Registry has a little bit of everything with a spectrum of pricing to match. Speaking of which, dR has an ad for this little vehicle on its site now. This is a 1986 Suzuki Samurai with a 305 cubic-inch Chevrolet V-8 under the hood, which is hooked to a three-speed automatic transmission. The front, and likely the rear end, are from a Chevrolet S-10 pickup. A Samurai V-8 swap is hardly unheard of in Suzuki circles; a number of people have done it, and there are companies that will sell the swap for these little trucklets. Some will even sell you a turnkey V-8 Sammi. The amazing part of this ad, however, is the $19,995 asking price. Oh, and the fact there isn't a single paragraph break in the 573 word description, making it painful to read. Speaking of the ad, the text refers to the Samurai as the "4-wheel drive equivalent of a Yugo," that is until it's been "transformed" into this vehicle, of course. The Samurai was a Spartan rig, for certain but it was hardly a Yugo. I don't doubt for a second this is a nicely built and restored vehicle with a ton of work into it, as the photos clearly show. I also don't doubt it's got plenty of grunt—definitely a sleeper. 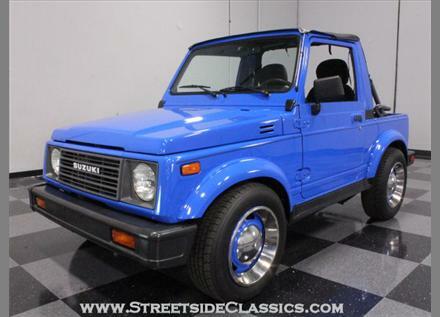 But $20K for a sleepy V-8 Samurai? That's a lot of change for what is essentially a V-8-powered Yugo, no? Samurais already sell for way-higher-than-expected prices on Craigslist. Beat-down, off-roaded-to-hell, rot-box rigs still command $3,000, with really nice versions, even well-preserved stockers, going for $5,000+. But this Samurai takes the cake for the highest priced Samurai I've ever seen. Wow, they certainly have lowered the price, eh?